The Comet was built by a gentleman by the name of George Ault at Portsmouth village (which has since been swallowed up by the city of Kingston) in the year 1848. The ship was a steam driven side paddle wheeler of some 175 ft long 24 ft in breadth and 10 feet in depth. In 1851 it was renamed the Mayflower. Then in 1861 the ship was refitted and renamed the Comet. On an evening in the year 1861 the Comet left Kingston in heavy winds to make the trip up the lake. Near the false Duck Islands it was run down by the Schooner Exchange. The Comet badly damaged and with out power was driven down wind in the direction of Kingston. 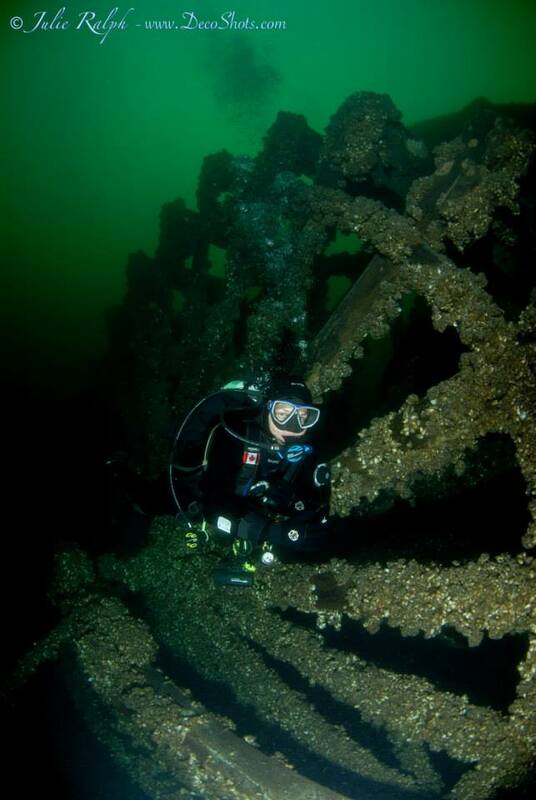 It finally sank 2 miles off Simcoe Island out side Kingston’s harbour… It sits upright in 80 feet of water. The superstructure is gone but the two massive paddle wheels some 32 feet across sit upright on the bottom still connected to the walking beam engine. The anchor windless, wheels, engine, rudder, stove, plus much more await the diver. P.O.W. marks the wreck with a mooring.